Elegant and substantial in size, orangeries are a fantastic way to add valuable extra room and a little bit of high-end luxury to any home. Comfortable for year-round use, investing in an orangery will provide you with a living space that is light, warm and super stylish. Be inspired and take a look at the amazing collection of bespoke orangeries now available! Designing your own bespoke orangery is a great way to add extra living space to your home. Orangeries do vary in price depending on their design, but the cost of an orangery is often cheaper than building a traditional full-brick extension. A beautiful orangery extension won’t just make your property bigger, it will also make it more desirable and increase your home’s worth. Adding extra versatile living space will improve and enhance your day-to-day lifestyle – providing a space to relax and entertain. 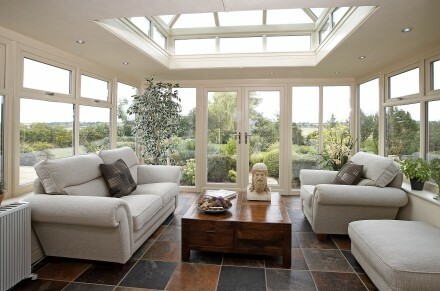 Luxury orangeries can be very light and airy, helping to breathe new life into adjoining rooms. Cool in summer and warm in winter, orangery extensions are perfect for all seasons. 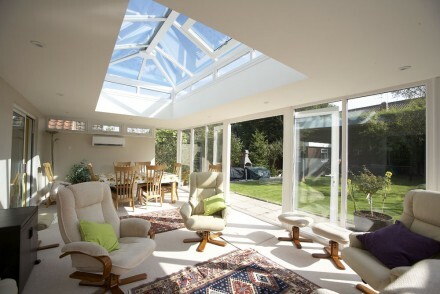 An orangery is a stylish and seamless way to add extra living space to any property. Coupled with bi-folding doors, orangeries naturally link your home and garden - blending the best aspects of a conservatory and traditional extension together to create an airy room that's useable all year round. Discover the questions you MUST ask before choosing your orangery builders! An orangery extension is normally constructed using brick pillared corners and a flat roof – topped with a stunning glass lantern roof or modern Skypod to add drama, height and a natural focal point. 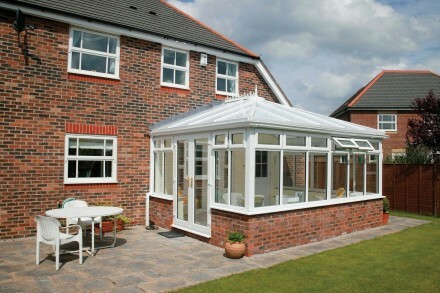 Because of the way they’re made, orangeries don't become too hot in summer or too cold during winter. With no extreme temperature fluctuations to worry about, they're ideal for use as a dining room, home office, play room or a modern kitchen-dining space that can be enjoyed by everyone. Whether you prefer a modern or traditional style, EYG can cater for your exact requirements - click now to learn the main benefits of an orangery and see how one could improve your home. With a range of flexible funding options available - including the opportunity to buy now and pay nothing for 12 months, we make it easy for you to invest in a bespoke orangery. Transform your home and lifestyle, get in touch for a free no-obligation quote or call 0800 181888 today! Will I need planning permission for an orangery? Orangeries often require planning permission but, in a lot of instances, they can be added to a home under permitted development rights. If the ridge height of your orangery roof (the top point) is less than the eaves on your property's roof, planning permission may not be needed. If planning is required, we can take the stress and hassle out of the process by securing planning permission on your behalf. This will be done before any final orangery costs are confirmed and prior to the start of the build – so you know your building work meets all of the necessary planning guidelines. What is the design and build process? The first step is to send one of our design specialists to your property to give you a free no-obligation quote based on your exact requirements. Once you’re happy with the price and have chosen a payment plan, we’ll conduct a detailed site survey to check on drain levels and the impact of any proposed new roof heights. After a second survey, we’ll arrange a date to start the construction process. Any trench footings needed will be dug to a minimum depth of 650mm, with a full damp proof course membrane (carrying a 10-year warranty) put into the base. At EYG, we carry out all the manufacturing and installation work ourselves - thanks to our expert team of fully-qualified tradesmen, who boast qualifications that are recognised by the major UK trade associations – giving you confidence that your investment is in safe hands. How long does an orangery take to install? Obviously, the amount of time it takes to install your orangery will depend largely on the size and complexity of your chosen design. We will provide you with an accurate fixed-price quote and let you know approximately how long the project will take to complete after an on-site inspection. What types of orangeries can EYG design? Every bespoke orangery we design is made to measure. Whether you want a contemporary or traditional look, we can use UPVC, aluminium or timber to suit your exact requirements – simply choose the material and style that’s best for your home. What finishing touches can I choose? It's often the little finishing touches that make your orangery extension unique. At EYG, we work closely with you to finalise a design that fulfils your needs - and budget. We offer an extensive range of extras such as decorative glass, hinges, handles and pelmets which can hide internal lighting and external guttering. Be creative and consider incorporating spotlights and uplighters to add drama and ambient light inside your new living space. Aluminium bi-fold doors are a great way to link the inside and outside of your home, but they’re not easy to add during the build so weigh up all your options in the design phase. Flexible payment options – no deposit & buy now, pay later deals! Established and trusted since 1971, EYG can provide you with a wide range of flexible funding options. Arrange for your orangery extension to be installed today, and you won't have to pay a penny – not even a deposit. If you want to fund the project yourself, you can. If you prefer to keep your cash in the bank, take advantage of our buy now, pay nothing for 12 months option. Or use our flexi-loan and spread the cost by paying in affordable monthly instalments. Be inspired, get in touch and transform your lifestyle today! 10-year warranty on all orangeries - invest with no worries! Just like every standard product in the EYG portfolio, all our luxury orangery extensions come with a ten-year warranty – so you can invest with complete peace of mind. Should you have any issues, we’ll repair or replace the problem promptly with no fuss. Understand why thousands of customers have trusted us since 1971, take a look at this impressive orangery extension project now! Transform your house into a cosy & comfortable home with EYG, one of the UK's best double glazing installers & home improvement experts! Are orangeries cold in winter?